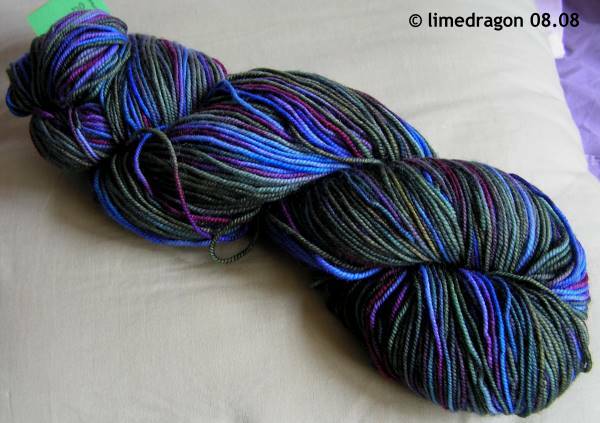 This cute little skein in lovely blues and greens was given to me by my parents after a trip to Michigan for a family reunion in August. Grandma liked the colors, so I decided to make something for her, and I knew just the thing. It was a fairly quick knit, and I took a calculated risk (that means I did the scary math thing), and worked one extra repeat of the shawl before the border section. I ended up with just 7 grams left in the end, woo! 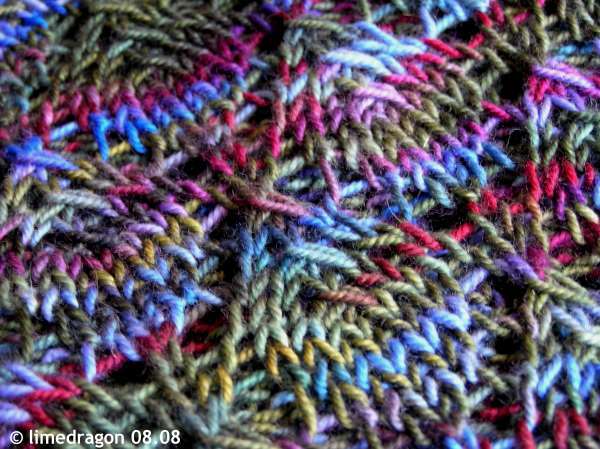 The colors in this shawl were difficult to photograph. They’re much deeper and more vibrant than these photos show. 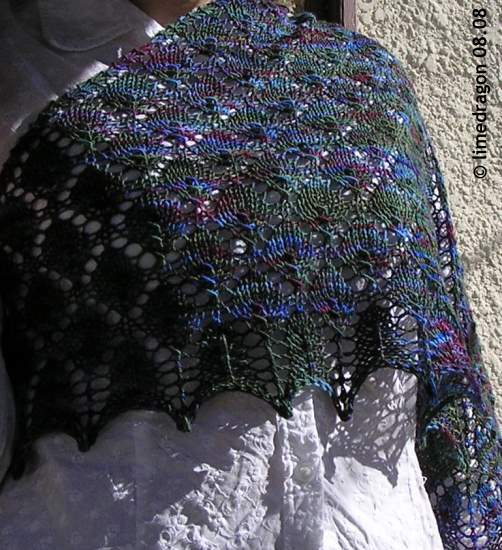 After blocking, the width of this shawl was about 48″, not very big. As you can see, it does fit over my shoulders and should work well with Grandma’s narrower shoulders as either a shawl or a scarf. Happy Birthday Grandma!! 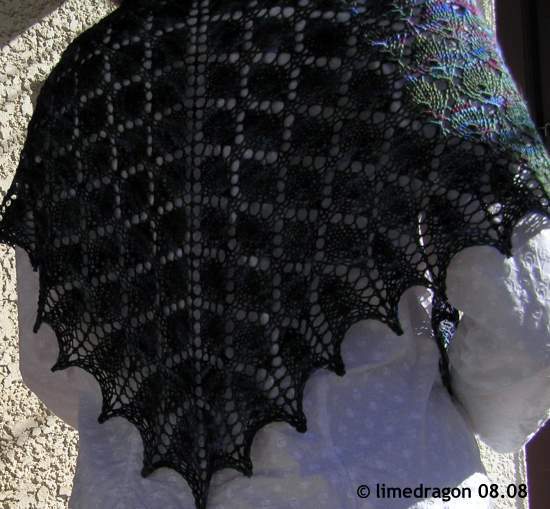 Pattern: �Forest Canopy Shoulder Shawl� by Susan Lawrence, I�m knitting as fast as I can (or get it via Ravelry) Size: About 49? long across the top, blocked. Yarn: Colinette Jitterbug, Dusk Needles: Takumi Clover US 7 (4.5 mm) circular Started: August 20, 2008 Completed: August 26, 2008 Token Progress: 1 of 2 1 laceweight token pending. 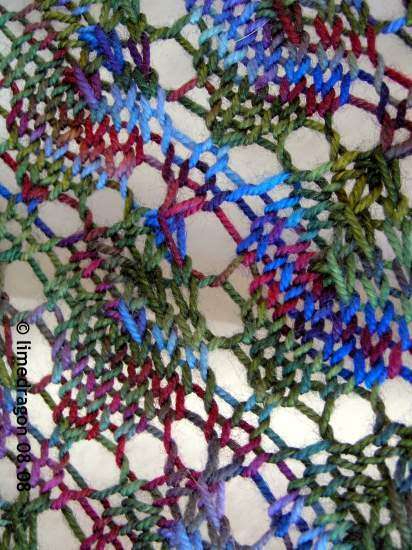 Very stunning shawl. I’ve sent up many prayers for your family members, may you experience much luck and healing. Gorgeous! Lucky Grandma! I am sending lots of healthy thoughts to your family. The shawl is lovely. Hugs to you and your family. Seriously beautiful! HUGS for your family. Beautiful! Consider me thinking healthy thoughts in the direction of your family. Lucky Grandma! Beautiful shawl. Holding you and your family in my prayers. Sending your family healing thoughts. Your grandma’s shawl is stunning. Very nice! Yes… luck, and healing! I’ll keep your father in my prayers but that’s good news that he was accepted for a transplant and it looks like one has come his way. Your poor cousin! That shawl is just lovely. Hope your family is doing better. Love the shawl! It turned out really well. Beautiful shawl. I’m sending healing thoughts, and everytime I pick up my keys with the ‘recycle yourself’ tag, I’ll be hoping someone who’s number is up did the same thing. I’m just catching up with blog reading and wanted to let you know that you and your family are in my thoughts.